In the past few years, U.S. officialdom and the mainstream press barely take note of dead Afghans unless the number exceeds thirty. in villages like Sperwan Ghar, Lay Kundi, Laknai, etc. in the Panjwayi district, Kandahar Province. NATO forces in Afghanistan have killed scores of civilians in a single operation, bombing them in their own homes as they celebrated the end of Ramadan. U.S/NATO war planes bombed villages during the last day of the major Islamic holiday of Eid al-Fitr in a region that was allegedly cleared of résistance fighters two months ago during the much heralded Operation Medusa. Witnesses said the U.S/NATO “precision” bombing razed 25 homes in 4-5 hours of (NATO typically reported it had allegedly killed “38 Taliban fighters”). Ahmadullah, from Zangawad village, said 50 homes were bombed and that residents had retrieved 30 dead bodies from the rubble. Many corpses were still buried. Per Agha, moved his injured relatives to a hospital in Kandahar and said one woman in his family was killed. Agha said some family members were missing. After visiting the wounded in a hospital, Nik Mohammad, a tribal elder, said that 60 civilians had died in the incident on Tuesday. A villager, Karim Jan, said between 60 and 70 had died. The International Committee of the Red Cross (ICRC) said that at least 70 civilians were killed. Another villager, Jamila Bibi, said about 20 members of her family were buried under the rubble when their homes collapsed from the bombing. Abdul Aye said his brothers, uncles, nieces, and nephews were buried when a NATO airstrike collapsed the thick, dried-mud walls of their village home. "Everyone is very angry at the government and the coalition. There was no Taliban," Abdul Aye, a villager, said through tears at the funeral. He said 22 members of his extended family were killed, adding, "These tragedies just keep continuing." At a Kandahar funeral, a villager named Taj Mohammad said 10 members of his family died in the fighting. "There were no militants," he said. "Innocent people have been killed." Another man said women and children were among 15 members of his family who had been killed. "The airplanes came and were bombing until 3 am. And, in the morning, they started hitting our village with mortars and rockets. They didn't allow anybody to come to our help." Other refugees reported that NATO troops had sealed off the roads and that some wound3ed made it to Kandahar by crossing fields. A hospital attendant, Dad Mohammad, said NATO forces had heavily hit Laknai village in the Zangawad area of Panjwayi, saying 90 civilians had perished. Lawmaker Habibullah Khan said 22 people were buried overnight in a mass grave in Mirwisa Mina, a village about 10 miles west of Kandahar. Atta Mohammad, 40, from Zangawad village, which was bombed during the NATO air strikes on Tuesday, was waiting in front of the surgical ward of Kandahar's Mirwais hospital to visit relatives. "[Some] 62 of our villagers have been killed and buried, including women and children, while another 12 were injured during the air strikes," Mohammad said. "There are even households which have lost 20 to 22 of their family members in these air strikes. Just yesterday we recovered some of the dead bodies trapped under the ruins using a tractor.” Toor, 25, an Afghan farmer lay covered with dust and bloody on a stretcher in Mir Wais, and recounted, “we were under bombardment and airstrike from midnight onwards…we couldn’t move, there was fire everywhere. Then I hit in the leg. I crawled out with my wife and 3 brothers. All of us were wounded. We saw dead and wounded lying everywhere as we escaped: men, women and children.” One local man who did not want to reveal his name said 20 members of his family had been killed and 10 injured. "Anyone can come here to see our homes and area. There are no Taliban here. We all are nomads living in tents," he said. "Each time they say that it was a mistake. They have destroyed us all in such mistakes. For God's sake, come and see our situation." Haji Shah Mohammad, a senior member of Kandahar’s provincial council, described, “I’ve just called President Karzai and he switched off the phone. Three of my nephews are dead and three more of my family are wounded. I called the Governor (Khalid) but he switched off his phone too. 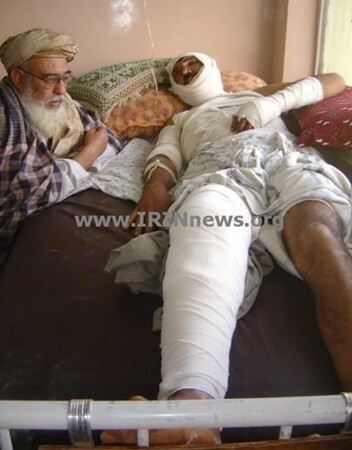 Who will hear us?” Abdul Karim, an old man injured being treated at Mir Wais Hospital, said that “as the foreign troops arrived, they shot dead my injured son on the spot.” Another wounded, Abdul Ghafoor (Ghaffor? ), said 7 of his family members were killed in the NATO air strike (his wife, 4 sons and 2 daughters). The Karzai regime puppets are not responding any more until they can piece together their lies. Even the Karzai puppet regime’s Interior Ministry spokesman initially admitted that more than 40 villagers had been killed in the NATO raids. The Panjwayi district chief told AFP he had reports of 60 civilians dying. Kandahar provincial council member, Bismallah Afghanmal, noted that the Afghan Defense Ministry is heading yet another “investigation.” But Afghanmal said villagers were tired of investigations, “These kinds of things have happened several times, and they (NATO) only say ‘sorry.’ How can you compensate people who have lost their sons and daughters?” For his part, Hamid Karzai trotted out his usual apology when his innocent countrymen die at the hands of the U.S/NATO, saying he “was hurt and saddened.” The photo (by Allauddin Khan, AP) shows villagers walking next to destroyed homes and killed livestock. On October 26, 2006, Haji Nik Mohammad (above left) from a village in the Panjwayi told assembled journalist: “I prefer to join the Taliban forces because Taliban have so far killed only 2 people in my village while the coalition forces killed 63 people in a single day. 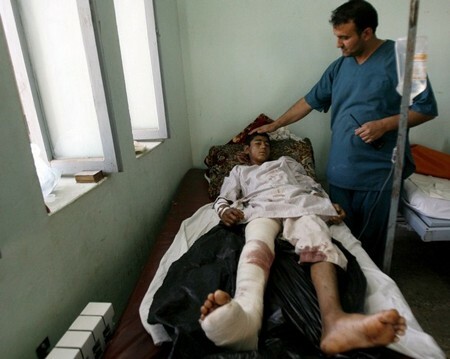 Now you tell me who is my real enemy, the Taliban or the foreign troops?” The right photo depicts 12-year-old Abdul Ghaffor in Mir Wais Hospital, another victim of the murderous NATO/US attacks. An angry doctor at the hospital told The Times (London) as three boys, all wounded by NATO/US shrapnel, were wheeled in, “What do you foreigners think you are doing? You bomb civilians, then come to talk to them. Better if you leave.” A senior NATO officer was quoted in The Globe and Mail on Friday saying "what is being reported as civilian casualties are the bodies of insurgents." Why don’t we hear anything about the estimated 65 Afghan and Pashtun civilians killed in U.S/NATO actions during August 2009? The answer is because the median number of deaths per incident in August 2009 where US/NATO actions led to civilian deaths was “only” four – far below the threshold of notice (becoming “mediagenic”), and thus hardly worthy of mention by the U.S. officialdom and press (especially when General McChrystal is trying to sell his “new” Afghan strategy that the United States is in Afghanistan to “protect civilians”). What constitutes such a threshold of notice for media is a different matter from the more widely studied question of press and public reactions to civilian deaths in wartime. (5) Another lesser contributing explanatory variable affecting whether an attack gets reported or not could be the lack of access to the site of the attacks. The midnight bombing of a large group of people congregated around two fuel tanker trucks in the Chahar Dara area of Kunduz Province on the night of September 3/4th, however, generated immediate and prolific media coverage. It presents a case study of both how the Afghan war is being fought militarily on the ground and in the media. The military dimension is quite clear. At about 10 P.M., a group of Taliban fighters high jacked two tanker trucks carrying fuel for NATO occupation forces some ten kilometers south of Kunduz city. The incident was reported by German forces to the NATO air command. Soon after the high jacking, the trucks tried to cross a small river and one of the vehicles got stuck in the mud about two kilometers from the village of Omar Khel. The Taliban present tried to disengage the tanker but failed. In order to make it easier to move the truck, they drained fuel. For reasons which remain unclear, word reached nearby villagers who rushed to the scene to get free fuel. At this point two United States Air Force F-15E Strike Eagles appeared and at 2:30 A.M. dropped two 500-pound bombs guided by a global positioning JDAM system. The predictable took place: a huge explosion which incinerated a large number of persons, killing and wounding many. Villagers said their relatives were siphoning fuel from the hijacked trucks and were burned alive in a giant fireball. Apparently, the American F-15E pilots and co-pilots dropped the two bombs upon the immobilized trucks, revealing an obvious lack of sensitivity as to who might actually be in the group of people around the trucks. The dearth of accurate ground intelligence possessed by U.S/NATO forces in Afghanistan is legendary. In other words, a deadly air strike was launched upon a target where the probability of civilians being present was high. The mainstream media narrative about the attack followed the familiar news management pattern of damage control. 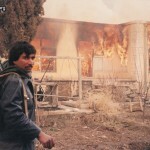 (7) The first reports took the Pentagon cue proclaiming that only Taliban or militants had been killed in a “precision strike.” Then when evidence mounted that civilians also were wounded and killed, put most of the blame on the Taliban for the civilian deaths (as did John Burns, chief foreign correspondent of the New York Times). An important point here needs to be stressed: what were once “Taliban” have now become “civilians.” One suspects that many of the so-called Taliban killed elsewhere across Afghanistan and in the Pakistan borderlands by the U.S/NATO/Afghan Army were civilians. The next step is to announce that an investigation will be carried out by the U.S. or NATO – in other words, the perpetrator will investigate himself (with predictable results). On the other hand, the more independent-minded media like Reuters, Agence France Presse and Pahjwok Afghan News begin presenting detailed stories told by locals present or near to the scene of the massacre. Time passes; the investigation languishes or produces utterly laughable “results” (as in the case of Azizabad, Herat) and some token “condolence” payments are made to victims’ family members. More likely than not, McChrystal or a simulacrum will then announce a new strategy solemnly inveighing to protect Afghan civilians. The Associated Press and Yahoo!News began the reporting by noting that a NATO airstrike had killed 90 people in a pre-dawn attack near the village of Omar Khel. They quoted the German military command which unequivocally asserted that “there were no civilian casualties,” adding however that locals reported civilian casualties. Soon thereafter, Reuters headlined “NATO strikes fuel tankers in Afghanistan, many dead.” The wire service report said while NATO believed all the casualties were Taliban fighters, angry residents in the northern Kunduz province said villagers were collecting fuel from the high jacked trucks and were caught in the blast. Asked how U.S pilots could know whether a crowd around the trucks included civilians, Navy Lt-Commander Christine Sidenstricker, press officer for the U.S and NATO forces said, “Based on the information available at the scene, the commanders believed they were insurgents.” By mid-afternoon on September 4th, the independent Afghan news service, Pajhwok Afghan News, was headlining “Scores perish in Kunduz” including “dozens of civilians” citing local officials. Pajhwok quoted a security official who said the death toll was more than 200, adding that the warplanes struck the people who had gathered to receive free oil distributed by the high jackers. A couple villagers were quoted by name who claimed that relatives had died. Pajhwok also noted that the director of Kunduz Hospital admitted receiving 15 wounded persons many of whom were writhing in pain, their skin peeling off as a result of severe burns. Such aspects were not mentioned in western news wire service feeds. The Deutsche Press Agentur relied heavily upon the initial account provided by Kunduz’s governor, Mohammad Omar. Omar stated that “around 90 people with around half of them civilians were killed in the explosions.” The wire service noted that a German military spokesman said, “There were presumably no uninvolved people,” meaning no civilians had perished. Soon thereafter, a no doubt chastised Omar changed his story saying later on Friday that up to 60 people, mostly Taliban, were killed in the NATO airstrike. Omar said, “The problem is that all those people around the tankers were badly burned and can’t be recognized, but they were mostly armed Taliban and the rest who went from the village at 2 AM cannot be other than Taliban.” He even added that four Chechens and a “senior Taliban commander” were killed in the blast. More details began emerging. The Telegraph’s Ben Farmer in Kabul quoted a local, Mohammad Daud, 32, “Villagers rushed to the fuel tanker with any available container that they had, including water buckets and pots for cooking oil. There were 10-15 Taliban on top of the tanker. This was when they were bombed. Everyone around the fuel tanker died.” Other accounts from the Kunduz hospital noted a large stream of wounded arriving with horrific burns including a ten year-old boy. A report by Frank Jordans of the Associated Press estimated 40 civilians had perished and quoted a member of the Kunduz provincial council and a native of the village where the attack took place (Omar Khel), who said some 500 people from surrounding villages had swarmed around the trucks. He said villagers told him the insurgents had invited them to help themselves to the fuel, “The Taliban called to the villagers ‘Come take free fuel,’ he said, and the prospect of free fuel must have been irresistible. ‘The people are so hungry and poor’.” The official added that five people in a single family had been killed and a man he knows named Haji Gul Bhuddin lost three sons. The desperately poor Afghan villagers heard that the Taliban had abandoned loaded fuel tankers by the river and thought it was their lucky day. Hundreds ran to fill jugs of the valuable stuff. Suddenly, a U.S. F-15 fighter jet roared over and opened fire. Mohammad Deen heard the explosion. When the flames died away by Friday morning, charred corpses were still strewn on the riverbank. Afghan officials say as many as 90 people died in the strike, which NATO forces say was called in by German troops to target Taliban fighters who had hijacked two fuel trucks. Villagers could scarcely conceal their rage. "It's a tragedy, and people are angry, very angry. The international community came here to help, but they are not helping anymore, they are only dropping bombs on us," said Deen. Video footage filmed by Afghans at the scene the next morning showed piles of charred bodies lying by the river, beside chunks of twisted metal. The frame of one of the tanker trucks still smoldered. In the nearby provincial capital Kunduz, dozens of villagers, some visibly angry, gathered at a small regional hospital, a crumbling concrete building abuzz with frantic activity as doctors treated more than a dozen injured. Burn victims lay bandaged and groaning in the courtyard. Some waited to be airlifted to Kabul for more treatment with the help of the International Committee of the Red Cross (ICRC). ICRC spokeswoman Jessica Barry, part of a team trying to help evacuate some of the wounded, said it was impossible to know how many people had died. One man, Wazir Gul, stood still as he watched his badly burned brother, Mohammad, lying motionless under a white cotton sheet in the back of a battered pick-up truck near the hospital. "He is so burned and injured that he cannot move," Gul said.Many said they too, did not know how many people had died, fearing many bodies may have been washed away by the river. Others did not know what the Taliban were doing in their area and what the fuel tanks were meant for. One village elder said anger at the foreign troops was mixed with resentment toward the Taliban themselves, traditionally entrenched in the south but increasingly active in northern provinces like Kunduz. "The Taliban stole that fuel for themselves," said Haji Amanullah, the elder. "They could not use it so they dumped it. It's not like they are helping any of us. We can only pick up things they abandon." Rajiv Chandrasekaran of the Washington Post (predictably) initiated the “blame the Taliban” for civilian deaths line of argument quoting the unrepentant German military officers who asserted that all those killed were insurgents or people conscripted by the Taliban to help with the theft of the trucks. Being well-connected to the foreign militaries, Chandrasekaran was able to provide some interesting additional technical details. A B-1B bomber had been in the area when the trucks were high jacked and spotted the trucks bogged down while trying to cross a river. German commanders on the ground became concerned the trucks would be used as suicide bombs against their Provincial Reconstruction Team located about 10 kilometers away. As a result, they declared an imminent threat and requested air support. Two F-15Es arrived at around 2 AM local time. Some thirty minutes later upon receiving instructions from a “German targeter” one of the U.S planes dropped two 500-pound GBU-38 bombs, one on each truck. Fuller details of the Kunduz airstrike will take some time to emerge, if they ever do, but early reports that the Taliban hijackers of the fuel trucks may have allowed or encouraged local civilians to gather around the trucks to siphon fuel suggest that that the men who seized the trucks may have been careless at best, cynical at worst, in allowing civilians to put themselves at fatal risk by assembling around a potential military target. This, too, is another ugly feature of the Afghan fighting, as it has been in Iraq – an insurgency that recognizes the propaganda value of America killing innocents, and doesn’t care greatly, if at all, about the carnage that ensues. By late on Friday, various news wire services reported that NATO was launching an inquiry into the bombing and by early Saturday NATO officials were on the scene near Kunduz seeking to calm Afghans after the deadly strike. McChrystal uttered the predicable, “I take this possible loss of life or injury to innocent Afghans very seriously.” Lynne O’Donnell of the Agence France Press struck a more skeptical note headlining “NATO strike hits heart of new Afghan strategy.” She noted the atrocious timing of the U.S attack – as a ‘foreign consultant’ in Kabul put it, “It couldn’t have come at a worse time for the Western powers trying to justify their presence in the country” – and reporting a chorus of interests demanding an investigation. No one dared raise the matter of a truly independent investigation. 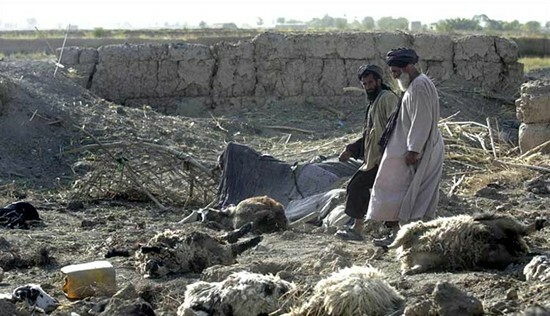 Residents of Chahar Dara district in northern Kunduz province say more than 150 civilians were killed and 20 others wounded in Friday's air strike by NATO-led forces. The bombing in Haji Aman village came as insurgents and residents emptied oil into jerry canes from tankers hijacked by Taliban militants from the Kunduz-Baghlan Highway. Inhabitants of the area told Pajhwok Afghan News all those killed in the bombardment were civilians and there were no Taliban at the site at the time the attack took place. Fighters had left the scene after they asked the people to take fuel for free. An elder from Sarak-i-Bala neighbourhood, Abdul Rahim, said 15 children were among the 50 people of Yaqubi village killed in the bombing raid. The man, who lost two sons in the incident, argued: "Poverty brought us to this stage." No guerrillas were among the dead, he said, explaining the fighters well before the deadly assault. A 50-year-old woman bitterly cried while standing in front of her ruined house. She said her three sons, husband and a grandson perished in the bombardment. Locals showed this reporter as many as 50 graves of civilian victims. In the Maulvi Naeem village, residents said 20 civilians were killed in the incident. Haji Najmuddin, a tribal elder, lost two nephews. He claimed chemicals bombs were dropped on the villagers. Clothes of his nephews were not damaged but their bodies were badly charred, the man argued.This reporter saw the graves of those killed in the air strike. Seventy of the fatalities were from Yaqubi and Maulvi Naeem villages and the rest from three other areas. Local people are telling me 130 people have been killed despite all the promises of Nato to do fewer bombardments and reduce civilian casualties. There will be a reaction to this. It is a very bad day for international forces in Afghanistan. Weeping and reciting prayers, villagers knelt in front of about 50 graves dug outside Yaqoubi, a scattering of mud-brick huts near the site where Afghan officials say a NATO bombing killed scores of people, many of them civilians. They paid little attention to groups of Taliban men who watched the funeral service from afar. The fighters' presence underlined the Taliban's tightening grip in once-quiet parts of northern Afghanistan at a time when U.S.-led forces are battling to contain an increasingly aggressive insurgency mainly centered in the south and east. "We will take revenge. A lot of innocent people were killed here," one of the Taliban fighters, only his eyes left uncovered by a thick scarf, said at the funeral. 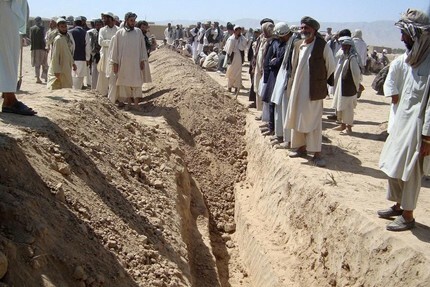 The dead villagers were buried in the presence of the Taliban. How many more recruits for or sympathizers of the Taliban have been created? Lest one blame only the Americans, a “coalition” ally, a group of Macedonian guards was sent home during 2009 because they were discovered drunk on duty, while protecting the back gate to Bagram. The 3,500 German troops were labeled by their German officers as “useless cake-eaters” who consumed 1.7 million pints of beer and 90,000 bottles of wine a year. The tone in Washington was different. The Washington Post’s Pamela Constable downplayed Afghan anger over the civilian deaths. (9) She quoted “some Kunduz officials” who said the killed villagers were all “relatives” of the insurgents and were “equally guilty” because they were looting fuel from the tankers when they died. In other words, for Ms. Constable being a “relative” of an enemy soldier makes her/him a justified military target. She also replayed the Taliban-are-to-blame mantra that 20 Taliban fighters had pressured villagers to go get free fuel and, ipso facto, the Taliban were responsible for the civilian deaths. Question posed and unanswered. No mention by this “progressive” that the stated Obama goals in Afghanistan today are identical to those of George W. Bush in 2001-2. No mention that a rapid exit might be the preferred option given that Al Qaeda can best be countered through patient international police work – as shown by the capture of major Al Qaeda leaders in Pakistan, not Afghanistan - rather than occupying countries and bombing their inhabitants. McChrystal bans alcohol consumption for his troops; Pamela Constable pronounces a new definition of enemy combatant, all the relatives of enemy combatants. The Taliban call for an international investigation of the Kunduz massacre and Andrew Bacevich pleads for a mirage to Obama’s open-ended war. 5) As for example analyzed in Eric V. Larson and Bogdan Savych, Misfortunes of War. Press and Public Reactions to Civilian Deaths in Wartime (Santa Monica: Rand monograph Project Air Force, 2006), 298 pp. available in electronic format at http://www.rand.org/pubs/monographs/MG441/ . A classic study is Edward S. Herman and Noam Chomsky, Manufacturing Consent. The Political Economy of the Mass Media (New York: Pantheon Books, 1988), 412 pp. 7) In order to not clutter the essay with too many footnotes, I have omitted footnotes here. They can be provided upon request made to the author. 23.08.2009: Obama’s Unspoken Trade-Off: Dead US/NATO Occupation Troops versus Dead Afghan Civilians? According to latest reports of the UN Office on Drugs and Crime, Afghanistan accounts for 80% of global opium and heroin production, the area of poppy straw crops reached a record 209,000 hectares in the country in 2013. Meanwhile, opium production went up 50% to reach 5,500 tons last year.